Teachers use a variety of approaches to teach students specific skills, concepts, and theories. Since the start of school, however, I have found myself pondering the question, How are we teaching children to learn? We are teaching our children that learning is a process comprised of facts and figures that must be memorized, rubrics that must be completed, and formulas that must be followed. This may sound fine to many. Teaching students the exact way to learn material and present what they understand ensures that the students learn a process. However, there are unintended consequences. In this week’s podcast, Dr. Berney and Dr. Richard discuss many of the unintended consequences of prescribed learning; which include decreased ingenuity, decreased love of learning, and an increase in wasted time. This podcast was edited by Mr. Andrew Rasmussen. We all know “black and white” thinkers. Though often used in a negative context, “black and white” thinkers tend to see through the gray in life and view things as either positive or negative. That is, they reduce decisions to a yes or a no and move on. Many people see this as a problem. After all, life is full of gray. Making a decision requires two steps. First we have to weigh the pros and cons, the advantages and disadvantages, of each option. This is the world of gray. For each option, there are numerous possibilities – some good, some not so good. As a result, we spend a lot of time in this step. The second step – choosing your option – gets us back to black and white. There is very little, if any, gray in this step. You do not have to sit and ponder. You will either go left or right, there is nothing between the two. Now that we have that sorted out, let’s get back to the real problem – all the gray to worry about and fuss over. At times, this decision-making leaves us paralyzed. It leaves us… decisionless. In this podcast, Dr. Berney and Dr. Richard talk about the importance of identifying the critical, fundamental question at the root of the decision. Once that question is identified, a black and white decision must be made. From there, all other “what ifs” will be dealt with. Dr. Berney and Dr. Richard also talk about therapeutic approaches to dealing with challenges associated with this first, and most critical step in making a change. If you are struggling with making a decision, we hope that this podcast will help you take the first step to change. This podcast was produced by Mr. Andrew Rasmussen. Well, the school year is underway and everyone’s schedule has adjusted to their new routines. In the weeks leading up to the start of school concerns voiced by most students centered on the anticipation of standardized, high stakes tests. Interestingly, since the school year started, the concerns shifted and the main complaint now is that students are TIRED! What is sleep anyway and how do we know if someone is getting enough sleep?!? It is recommended that we spend at least a third of our life asleep. Can it really be that important? What are the consequences of not getting enough sleep? Is it OK to sacrifice sleep when we have a lot of work to do? What is proper sleep hygiene? Is it OK for my child to “wind down” at night watching videos on his iPad? What is the best setting for sleep? In this podcast, Dr. Berney and Dr. Richard answer these, and many other questions on one of the most important parts of our lives. So have a listen and let us know what you think. Anxiety is a very common psychological state. In this podcast, Drs. Berney and Richard start by differentiating the terms worry, stress, and anxiety. They then move in to talk about how anxiety is treated and why it is important to seek support from a professional when struggling with uncontrolled worries. The treatment of Anxiety is a three pronged approach. First we must “Stop the Panic.” This first component helps relieve acute anxiety responses so that we can function and make better decisions. The second prong is to restore serotonin levels in the body. As Dr. Berney and Dr. Richard explain, serotonin is depleted when we are under long term stress and anxiety. The purpose of this component is to boost serotonin so that you can better regulate your mood and response to environmental stimuli. The final component is therapy to reduce anticipatory anxiety. Anticipation is a major part of anxiety. All of the “what ifs” result in a tendency to catastrophize. Therapy can help minimize the impact of these automatic thoughts and reorient you to a healthier way of thinking. Worry is a normal human function, evolved over time to keep us safe and alive. In healthy individuals, worry keeps us focused, attentive, and motivated to perform at an optimal level. However, there are times when our worries become intrusive and impairing. At these times, our worries do not help us perform. Instead, they interfere with our ability to problem solve and think critically. We are no longer able to function normally or make healthy decisions. In this episode, Dr. Berney and Dr. Richard discuss some of the broad categories of anxiety disorders and help listeners understand the impact that anxiety disorders can have on our life. This episode was produced by Mr. Andrew Rasmussen. In recent podcasts we have been discussing ADHD. We selected it because it is one of the most commonly diagnosed disorders in school age children and a primary reason for children to be referred to professionals. Children with ADHD have high referral rates not only because of their own learning difficulties, but because they are a distraction to teachers and classmates. Though less commonly referred because they are not a problem to others are students who have Anxiety Disorders. Statistically, anxiety disorders are almost twice as prevalent as ADHD. Unlike those struggling with ADHD, many students with Anxiety Disorders struggle in silence, as their stress is “internalized,” meaning that all of the discomfort, stress, and frustration is turned inward. Because they are not expressing their behavior outwardly, parents and teachers are often unaware that students with anxiety are struggling. In this podcast, Drs. Berney and Richard begin a series on anxiety disorders by discussing and reviewing normal anxiety. From birth through adulthood, it is normal to experience anxiety. In fact, anxiety is necessary as it warns us of potential problems in our environment. So a certain amount of anxiety and worry is normal. An important part of healthy development is to confront our anxieties and to develop the skills necessary for dealing with our stressors. When we think about Attention Deficit Hyperactivity Disorder (ADHD), we tend to think of three symptoms – inattention, hyperactivity, and impulsivity. However, ADHD is a heterogeneous disorder that affects a very important system of cognitive processes called executive functions. Executive functions help us organize our life, plan our approach to problem solving, inhibit behavioral and emotional responses, and problem solve. 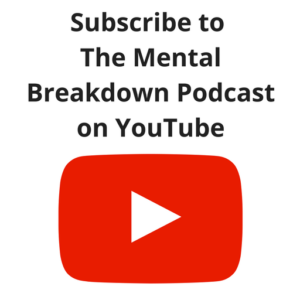 In this episode of The Mental Breakdown Podcast, Dr. Berney, Dr. Richard, and Mr. Rasmussen talk about these associated features of ADHD and the ways in which we treat them. Motivation is a real world superpower. We do not know where it comes from or how to create it, but everyone wants more of it. In this week’s episode, Drs. Berney and Richard review the pros and cons of Extrinsic and Intrinsic motivation. They review the relationship between motivation and ADHD and how delay of gratification plays a role in our ability to use motivation in our life. We also spend some time talking about the issue of passion and being creative. 3. Find a way to make progress (increase achievement)! In this week’s episode of The Mental Breakdown, Drs. Berney and Richard continue their talk about ADHD, one of the most commonly diagnosed conditions in childhood. They respond to several emails, focusing on issues that have resulted in an increase in the diagnosis and exploring explanations for why the rate of ADHD is so much higher in some areas than in others. They also begin a discussion on the elusive topic of motivation. We hope that you enjoy this episode. As always, we encourage you to write in to us, either on Facebook or on the mental breakdown website. We would also love for you to write a review on iTunes, which will increase our visibility and help bring more people to the pod. In this week’s episode, Drs. Berney and Richard respond to listener emails about ADHD. Specific topics discussed include the rebound effect – which is a phenomenon that happens to many children, late in the afternoon, when the medication is wearing off. They also talk review the truth about “adult onset ADHD” and the concerns of comorbidity (the presence of multiple medical conditions) in children. Have a listen and we hope you enjoy. Please, continue to end in your questions and write a comment or review on iTunes!